John Cage is best known for his indeterminate music, which leaves a significant level of creative decision-making in the hands of the performer. But how much licence did Cage allow? 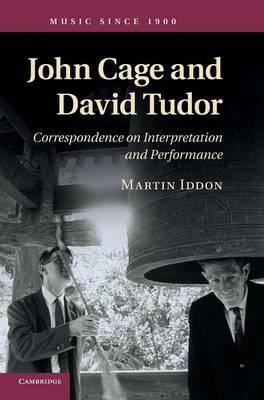 Martin Iddon's book is the first volume to collect the complete extant correspondence between the composer and pianist David Tudor, one of Cage's most provocative and significant musical collaborators. The book presents their partnership from working together in New York in the early 1950s, through periods on tour in Europe, until the late stages of their work from the 1960s onwards, carried out almost exclusively within the frame of the Merce Cunningham Dance Company. Tackling the question of how much creative flexibility Tudor was granted, Iddon includes detailed examples of the ways in which Tudor realised Cage's work, especially focusing on Music of Changes to Variations II, to show how composer and pianist influenced one another's methods and styles.